Please take a moment of your time to reach out to State Senators in Alaska, urge them to support legislation which would prohibit wolf hunting and trapping in two areas adjacent to Denali National Park and Preserve. House Bill 105 passed the House in 2017 and goes before the 20 members of the State Senate. Should the measure pass the Senate, it will then go to the Governor for his signature. Last year, the Alaska House of Representatives passed legislation to prohibit wolf hunting and trapping in two areas adjacent to Denali National Park and Preserve. House Bill 105, sponsored by Congressman Josephson, which seeks to ensure healthy wolf population for park visitors to enjoy, is worthy of your support. Denali is recognized as one of the best places in the world for people to see wolves in the wild. Each year, tens of thousands of visitors see wolves along Denali Park Road. More than anywhere else in Alaska, wolves in the eastern part of Denali provide significant benefits to tourism. The “harvest” of wolves, particularly breeding animals, has the potential to drastically decrease wolf numbers, influence pack social structure and reproduction, alter wolf behavior, and decrease opportunities for wolf viewing. Thus, even if hunting/trapping of wolves occurring outside the park has little effect on large-scale wolf population dynamics, it may still have significant effects on visitors experience. The Denali National Park and Preserve is a major tourist destination that hosts more than half a million visitors yearly, which, in turn, provides a significant boost to the local and statewide economies. Previous buffer zones have protected wildlife populations adjacent to the park from hunting and trapping. After eliminating the buffer zone in 2010, visitor wolf sightings dropped from 45% to just 6% in under four years. The “harvest” (heartless slaughter) of Denali wolves has disrupted their society, and destabilized the packs, which, in turn, compromised not only the pack hunting capabilities, but the very survival of remaining members. Hunting and trapping most often removes key pack members, or alpha wolves, and will usually lead to the disintegration of an entire family group. For example, in 2012, the trapping of the pregnant alpha female wolf from the Grant Creek group led to the group declining from 15 wolves to only 3 that year. Then in 2016 one of the two remaining East Fork wolves was shot just outside park boundaries. Because of the shooting of the radio-collared gray male (dubbed “1508 GM” by park biologists) the East Fork pack was reduced to one lone black wolf who, at that time, had pups, and now all are presumed dead. Recent photos posted April 3, 2018, by Public Employees for Environmental Responsibility (PEER) showing a man armed with an AR15 semiautomatic rifle, displaying ten wolf carcasses, confirms the urgency for a protective buffer zone. Though this incident occurred 70 miles away from the park, in GMU 13B, it could easily have taken place just outside the park, further decimating the population of beloved Denali wolf families. Voting in favor of House Bill 105 would help prevent these tragic losses. 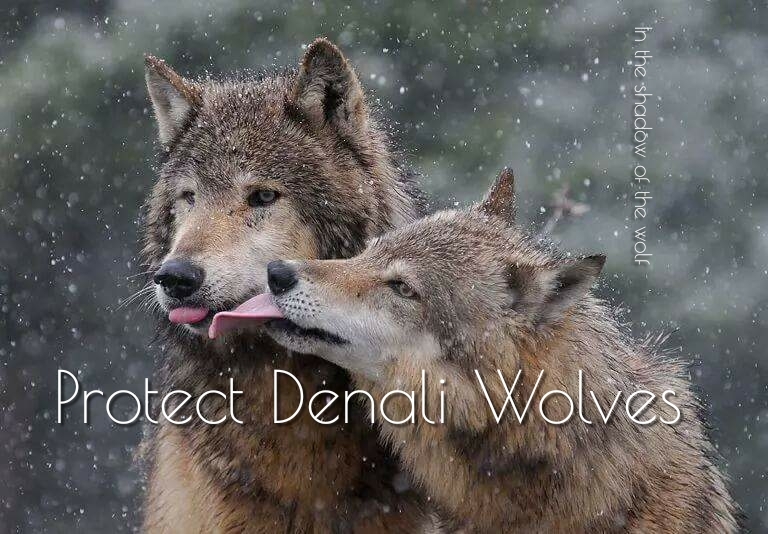 Protect Denali Wolves. Thank you for your time and consideration of this extremely important matter. I look forward to hearing from you. Thank you for sending your comments to my office. While I would be inclined to support such a measure I do not believe that the Senate Majority will give the idea much of a chance. Just the other day they sent out a press release saying that they were “dismayed by the environmentalist agenda” being proposed by the House. I have seen and enjoyed the Denali Park wolf pack, and been saddened by news of deaths. As will I, thank you, Lisa. please protect wolves from being killed . They are vital to the ecosystem and chain of life to which we all belong! Tourists flock from all over the world to see them in national parks , and they bring in much revenue , and are of great value to both the ecosystem and heritage. i and thousands of people word wide , hope for thier continued protection and preservation to keep them listed and protected from hunters. It is vital to save them . Done! Thank you for organizing this. Email sent !! hope so much it will help !! Thanks so much, Manuela. Appreciate your help! tolerance and understanding of the persecuted wolf. Can your organization ORGANIZE A PROTEST in front of Denali Park and advertise the MASSACRE of the wolves to the TOURISTS?????? I cannot organize a protest rally. However, I was looking into the possibility of putting up a bit of a shocking billboard near the main entrance to Denali, somewhere near or in Healy, which is 12 miles away. I have to look into costs and availability. If feasible, we would have to start a fundraiser. Thank you very much for your concern for the wolves. Thank you for everything you do to protect our Wolves. It seems however that we read more and more about a singular man taking the lives of 10 or more of these misunderstood animals with an AR15. Why are they allowed these war weapons for hunting? Any weapon is bad enough, but these, they can’t out manouver at all. They don’t have a chance of getting away. It breaks my heart knowing young pups are being killed so easily. I have become to loathe mankind more and more each day! I will always stand for Wolves.